"These are landmark performances of revolutionary significance. Prior to their release, collectors knowledge of Rameau was defined by small harpsichord pieces, a few dances and Alma Gluck's ancient recordiing of 'Rossignols Amoureux'. 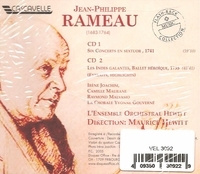 But these albums revealed Rameau as a mighty creator of inventive, colorful, vital and exciting music of far greater stature and power than what was known from earlier recordings. With his superb rhythmic sense, Maurice Hewitt brought a drive, energy, and sheer passion to the performances that was a very far from the delicate genteelism that was generally associated with Rameau in those days. Thus taking a first giant step in awakening collectors to the glory of the French Baroque."